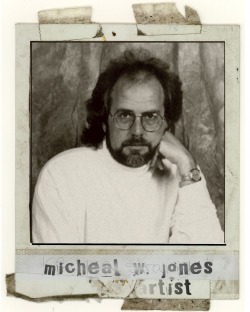 Micheal Jones was born in 1951 in Southwest Oklahoma. He sold his first oil painting at the age of 12, and continued his education in the fine arts, studying with Robert E. Wood and George Emmet Calvert, all the while developing his own personal style. He has exhibited in such prestigious juried shows as Watercolor West, The Rocky Mountain National Watermedia Exhibition, The National Watermedia Exhibition, The Eight-State Regional Watermedia and Seven-State Regional Watermedia Exhibitions, as well as National Watercolor Oklahoma Exhibit. He has had numerous one-man shows of his work, including a retrospective in the Oklahoma State Capitol. Miicheal is a member of the International Mezzotint Society, Oklahoma Watermedia Society, and the Green Country Watercolor Society, the Broken Arrow Arts and Humanities Council, and many other arts oriented organizations, and is an honorary member of the Southwest Art Guild. A selection of his mezzotints is currently touring Russia, with the "Out of Darkness" travelling exhibit. Micheal resides and works at his studio in Broken Arrow, Oklahoma.